The thread that I have traced in this book situates the protection of species in a long history of masculinist attempts to control the reproductive capacity of other animals.225 Whether other species are preserved as the source of "game," symbols of the frontier, representatives of a lineage, "living drama," or an "intergenerational narrative," the focus of protection is on the fertility of nature, not the individual beings that nature generates. Ecofeminists can not only deepen the questions posed in nature ethics, they can broaden the scope of concern. The holists in this study typify a common neglect of care within nature theories for the treatment of animals living in captivity. The suffering of the other–than–human animals who are subjected to experiments in laboratories or raised for food seemingly falls outside the purview of "nature." However, as the animal advocacy movement reminds us, nature is not only that which is perceived as the "wild"; nature is also inside laboratories, factory farms, fur ranches, and the many other places where other–than–human animals are subjected to manipulation and abuse. If we truly care about the natural world, then these beings should also be the focus of our concern. Ecofeminists can add still another dimension to the scope of nature ethics. Nature consists not only of the external entities that surround us; it also resides within our own psycho–social natures and identities. Although definitive answers may always elude us, it is important to explore the relevance of gender identity as a major contributor to nature abuse. While it would be foolish to argue that destructive attitudes toward nature can be attributed entirely to the influence of masculine identity, I have argued that it is equally misguided to ignore its contribution. A holist ecofeminist philosophy, as I conceive it, is not so much an ethic as a consciousness or ethos. It is a "way of life" or a mode of consciousness that invites us to be "responsible," not in the sense of conforming to obligations and rights, but in the literal sense of developing the ability for response. It is an invitation to dissolve the dualistic thinking that separates reason from emotion, the conscious from unconscious, the "domestic" from the "wild," and animal advocacy from nature ethics. It welcomes the larger scientific stories of evolutionary and ecological processes, but never loses sight of the individual beings who exist within these larger narratives. Ecofeminist philosophy never transcends or denies our capacity for empathy and care, our most important human connection with the natural world. 225. One of the standard definitions of species suggests the concern with procreation. As previously mentioned, the term "species" is commonly defined by an individual's ability to produce fertile offspring with her or his own kind. 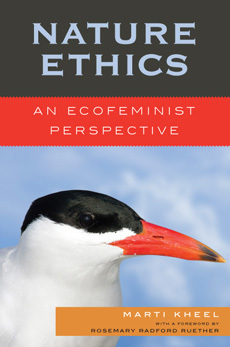 Nature Ethics: An Ecofeminist Perspective, by Marti Kheel, published by Rowman & Littlefield, Copyright © 2008. Excerpted by permission of the author and publisher. All rights reserved. No part of this excerpt may be reproduced or reprinted without permission in writing from the publisher. Nature consists not only of the external entities that surround us; it also resides within our own psycho-social natures and identities. Although definitive answers may always elude us, it is important to explore the relevance of gender identity as a major contributor to nature abuse.